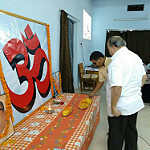 Vivekananda Kendra Dadar, Mumbai celebrated Ekanatji 100th birth centenary in 2014-15.Samidha prgramm was organised on 23rd nov. 2015 in karnataka sangh(Hall) from 7 to 9.30 pm. Ma. 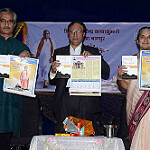 Nivedita Bhide, vice president of Vivekananda Kendra was chief guest. Vivekananda Kendra Kanniyakumari conducted Samidha on 19th November 2015 at Headquarters from 10am to 1pm. The people who are associated with Vivekananda Kendra Kanniyakumari through Rural Development Programm, Natural Resource Development Programme, VKNagerkoil, Ex-Vivekananda Kendra Vidhyalya students as well as parent, Ex-VKK workers, Suppliers, Donors, Patrons, Subscribers, Well-wishers and Beneficiaries were called for Samidha. Around 700 people gathered. While they were entering into the VK campus, went to Gangotri, then entered into Eknathji Samadhi for pushpanjali. Then they entered their particulars and received the calendars and assembled at VKV ground. In the presence of Treasurer, Vivekananda Kendra, Samidha started with lighting the lamp by All India Vyavastha Pramukh of VK and MEJSPKK. MEJSP report was read. Ma. Balakrishnanji's Presidential Address, Aa. Krishnamurthyannaji's Felicitation and Swami Chaitanya Maharaji, MEJSP Margadarshan committee's Blessings were there. Two well-wishers shared their experience. Eknathji Film in Tamil was shown. Samarpanam, Samidha concluded with Prarthana. Swadhyay Competition was held in month of September 2015 (dates 10 & 15) for Senior college youth on the book “Swami Vivekananda – Ek Prernastrot”. For “1 day Camp” - workshop of 3 hours was arranged. A workshop of 4 hours was conducted for Mahila Pramukhs of Self-help groups in collaboration with District Central Co-operative Bank. These Mahila Pramukhs handle, from 10 to 100 Self-help groups. b) Organizational Behavior (based on Seva Sadhana) by Ku. Jyoti Herkal. For basic needs of family necessary ‘Artharjan’ is essential. While living successful life efforts for ‘Saarthakata’ necessary. When people of different temperaments come and live together, mutual adjustment is a universal problem; as in the family so in the organization. WHAT TO SPEAK (ii) WHOM TO SPEAK and (iii) WHERE TO SPEAK. “Samarth” workshop for teachers was arranged. 23 teachers (Mahila -9, Men – 14) from 5 schools participated in the workshop. Additionally 5 karyakartas were in organizing team. The workshop constituted of Bauddhik Sessions which included interactions and live role plays, games and Yogabhyas sessions. 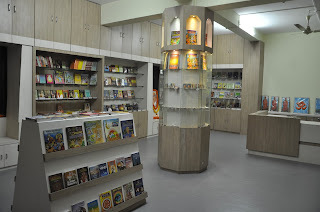 Book stall was arranged. A three hour workshop was arranged. In this, Vivekananda Kendra Parichay session, “Core of Yoga”- PPT and Yogabhyas were conducted. 51 participants attended the Prashikshan shibir (Mahila -21, Men -31. Out of which 8 doctors, 10 teachers, 12 college students, 21 grushasti). Shri. Basavraj Deshmukh (All India Prashikshan Pramukh) conducted the Prashikshan, Shri. Pralhad Parate ( VK Satara) conducted Yogabhyas session. Niyojan baithak was conducted in which 4 sectors (Education, Government, Mahila, and Entrepreneur) were decided and every sector was given a coordinator. Swadhyay Competition was held in months August –September 2015 for Senior college youth on the book “Swami Vivekananda – Ek Prernastrot”. Mohabeer Dharmasala in Rameswar am once provided shelter to thou sands of pilgrims visiting Rameswaram -the island in Gulf of Mannar known for its spirituality , natural beauty and cultural ethos. Unfortunately, this 18th-century building fell into ruin due to lack of care and maintenance. A group of heritage enthusiasts is now giving it a face lift. "Architecturally unique with exquisite domes at the entrance, this building can be an attraction for not just pilgrims but also tourists visiting Rameswaram. We have almost finished the restoration work and it will be open for public in December," said Asaithambi Gurusamy , conservation architect who is in charge of the project. It was after seeing the poor condition of the building that members of an architecture company , with the help of the Vivekananda Kendra, began to restore the Mohabeer Dharmasala a year ago. " As its name suggests, the dharmasala used to serve pilgrims. Later, it was used as a government office and was left unused leading to deterioration of the whole structure," said Gurusamy . "The building was constructed using lime mortar and brick with a Madras terrace roofing. When we first surveyed the building, it was in a very bad stage. It had lost its character. A part of the Madras terrace had collapsed. We had to start from scratch and it was challenging," he said. The restoration team removed the doors and windows and replaced them with fresh wooden ones with an antique touch suitable to the style of the building.The renovated Mohabeer Dharmasala will be open for the public in December and will host ethnic events and film shows. The first floor will house the office of Green Rameswaram project -an initiative of Vivekananda Kendra that aims at ensuring a green and hygienic pilgrimage to those visiting the holy island. The building will also feature an exhibition on the green technologies used in the restoration process. "In Rameswaram, a number of ancient buildings face ruin. This initiative shows many old buildings in the town can be restored in a similar way ," said Gurusamy. Vivekananda Kendra Vidyalaya (NEC) Baragolai took part in CBSE Cluster-I Kho Kho Tournament from 17th to 19th October 2015 in ‘under 19’ category (both boys’ and girls’ teams) at Budding Buds Senior Secondary School, Tinsukia. Both the teams of the Vidyalaya played 4 matches each in total and both teams became the champions of the Cluster-I. In both the categories 21 teams (10 boys’ teams & 11 girls’ teams) played. Final matches were played between our Vidyalaya and Hindustani Kendriya Vidyalaya, Tinsukia (Boys’ Category) and between our Vidyalaya and Budding Buds Senior Secondary School (Girls’ Category). Kr. Suraj Lama (Class-X) and Km. N. Puspa (Class-IX) were adjudged the Best Players of the tournament. Prizes were distributed on 19th October 2015. Both the teams of our Vidyalaya are going to play in the National Championship from 14th to 18th December 2015 at Sant Ishar Singh Public School, Chhahar (Via Dirba), District-Sangrur, Punjab. Inauguration ofVKV Dollungmukh: The 34th VKV of Arunachal Pradesh was inaugurated in Dollungmukh on 28 September 2015.Shri BengiaTolum, Nyishi Elite Society president and Shri.Rakesh, Executive Director NHPC Subansiri Project jointly inaugurated the VKV in the presence of Dr. Joram Begi, Director of all the VKVs of North Eastern Region & Trustee of VKVAP Trust, other dignitaries, a large number of well-wishers, officials of NHPC and parents. It was encouraging to see the enthusiasm of people who have assembled there. NHPC is committed for the creation of infrastructure under its CSR scheme. Varsharambha Ceremony of VKV- Dollungmukh: - The first Varsharambha Ceremony of VKV- Dollungmukh was conducted on 30th September Sri.Unnikrishnan.P.M, Education Officer, VKVAPT, Shri.Rudra Prasad Dhungana from VKV- Banderdewa and I could be part of the Varsharambha. A good number of parents attended the programme. The team under the leadership of Shri R.Murugan and his team are set to make a big difference in the area with their selfless work. The school is having class I to III with 72 Students in roll. Out of 72, 26 (boys) students are hostellers. Glimpse of Vivek Kiran Activities :- The unique service project namely ‘Vivek Kiran’ undertaken by VKVAPT in collaboration with Navajbai Ratan Tata Trust for strengthening the formal education system of Kimin circle saw varied activities during the last two months. Some of them are 5day residential camp for Anganwadi workers wherein Smt. Sulabha Kulkarni and Smt. Meghna Paranjpe from Jnana Prabodhini, Solapur Maharashtra guided the participants; Health checkup in all the Anganwadis, covering 750 students; Science camp for Government school teachers, setting up of a resource centre at VKV Sher etc. Chintan Baithak of VKVAPT: A Chintan Baithak was organized by VKVAPT from 12th October to 15th October at Dibrugarh. Administrative committee members, Cluster in charges, VKVAPT core team members, one the senior Principals were participants in the same. The meeting was facilitated by Dr. Ajit Kanitkar, a well known management expert from Pune, Maharashtra. Mananeeya Nivedita Didi, all India Vice President of Vivekananda Kendra participated in the Baithak on 13th& 14th October for a short duration. The Chintan Baithak took stock of the works of VKVs in the last more than 35 years in terms of present context in order to chart out a roadmap to be followed to remain as a premier educational institution contributing to the development of Arunachal Pradesh. Various topics were dealt with in the Baithak by brainstorming, sharing of experiences, group discussion and presentation, case studies etc. Workshop for Principals: A five day workshop for selected Principals of various VKVs of Arunachal Pradesh was conducted in VKV Nirjuli from 25th to 29th October 2015. 18 Principals and 3 cluster- in charges attended the workshop. The workshop was designed to provide updated inputs in order to equip the Principals with skills to execute diverse roles effectively. Sri Aravind Gore, an eminent teacher trainer and academician from Maharashtra was the main resource person. Sri Pravinji, Secretary VKVAPT was present in the inaugural ceremony. All the members of VKVAPT core team, Cluster In charges were present in the entire program. The training event was marked by activities tailor-made to develop various skills. Prachodaya Shibir: The Shibir for the high achievers studying in Class IX in different VKVs of the state was held in VKV Itanagar from 29th to 31st October. 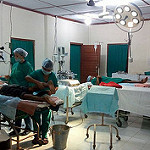 A total number of 159 students (62 Boys and 97 girls) from 21 secondary and Higher Secondary VKVs attended the Shibhir. Reaching out to the neighborhood schools: - Many VKVs conducted personality development Camp namely Sadgamaya for the students of neighboring schools during the Mid Term Break. Altogether 959 students attended the camp in various VKVs. The students were exposed to the routine life, inspirational lectures,Games, Group discussion etc. VKVs Amliang, Sunpura, Jirdin, Balijan, Nirjuli, Yazali, Tafrogam, Jairampur, Banderdewa conducted the camp. We are yet to receive report of some of the schools. Vimarsh Conducted: In continuation to the Vimarsh series which has been taken up as a part of the yearlong celebration of the Mananeeya Eknathji Janma Shati Parva, many VKVs conducted Vimarsh on different topics in the month of September. VKVs Jairampur, Koloriang, Kuporijo, Raga, Roing, Nirjuli, Amliang, Ziro, Sunpura conducted Vimarsh during the last two months. Mananeeya Nivedita Didi, Vice President of Vivekananda Kendra was present for Vimarsh in Nirjuli on the topic of Dharma. Major Celebrations:-Universal Brotherhood Day, Krishna Janmashtami and Ganesh Chaturthy were celebrated with great enthusiasm in all the VKVs. During the Universal Brotherhood Day celebration “SPIRITUALIZING LIFE” a compilation of Mananeeya Eknathji’s Lectures, was released by the Chief Guest, Sri. Mohesh Chai, Hon’ble MLA at VKV Tafrogam and he spoke on Mananeeya Eknathji’s life and message and contribution for the Man Making and Nation Building following the footsteps of Swami Vivekananda. While expressing his gratitude to Vivekananda Kendra for its selfless contribution through VKVs and Arun Jyoti project for Arunachal Pradesh, he remembered all the workers who were and are tirelessly working to develop the state. This month newsletter we bring you two panels from Gramodaya Park that explain the importance of traditional water harvesting and water management systems which exist throughout South India. The Traditional water bodies (TWB) which we are renovating as part of the Green Rameshwaram projects are part of this larger systems. The principles behind these systems are explained in these panels. They should be understood to realize the context and importance of the renovation work that is being carried out by VK-nardep in Rameshwaram. It is both sacred and ecologically significant work. Today we have identified all the lost traditional water bodies in the island and have started renovating them. We have already successfully renovated 16 of these endangered water bodies. In 'the happenings' section you can get a glimpse of our work in various fronts including sustainable agriculture, renewable energy and traditional medicine. We are happy to announce that we have conducted the national level seminar on Varma-Siddha therapy for joints and nerve problems. The function brought together more than 200 traditional Vaidyas and medical professionals and the event became an important step in conserving the traditional knowledge and disseminate it. Koodankulam Project Director Dr.Suresh and Kendra Vice-President Sri.Balakrishnanji graced the occasion. The regular training programmes on bio-methanation plant, extension activities in the form of study tour visits and construction of bio-methanation plants have been conducted.In Green Rameshwaram you can see the renovation works being carried out at the heritage building and also the phyto-treatment work through Vettiver and the newly discovered buried 'Parasuramar Teertham'. In our publication section we introduce our 'manual for good hygienic practices' and a book on traditional medicines for daily use. Both are books published under the 'Green Rameshwaram' project with patronage from UNICEF. In our wisdom section we have Sri Aurobindo explain the importance of nature in evolution, the Japanese concept of equanimity of vision (banbutsu seidou) and we have a potter-Artist Rupert Spira explaining painter Paul Cézanne's saying that “A time is coming when a carrot, freshly observed, will trigger a revolution": "Cézanne meant that if we could see even a simple everyday object such as a carrot, as it truly is, our experience would be revolutionized."